Why is this terrible photograph being displayed with this article? Well, here's the rest of the story. Everyone who takes up photography has a few photographs that just seem to have gotten away. The elusive photograph that never seems to cooperate. The sun is never in the right position in the sky, the clouds roll in, an animal moves and on and on. Some of those moments seem to remain with us forever as we recall the ones that got away. 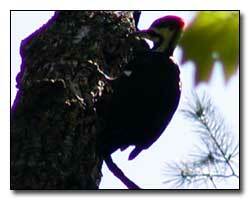 Well, for many years, I have wanted to photograph the Pileated Woodpecker. I have seen many, but never close enough to photograph. Most of the time the bird has been at a distance and high in a tree. The bird is a big bird, 16"-17" long with a wingspan of 29", so you do not have to be as close as a songbird. Since I never use a blind, the bird usually sees me approaching and moves on. As I was walking through the woods, I heard the loud drum of the Pileated Woodpecker. It was nearby so I swiftly moved toward the sound. I was getting close when the noise stopped for a moment. "Had I scared the bird away? ", I wondered. Just then, right above me, I heard the loudest drum of all times. My wife, who was with me, looked up. Twenty feet above us was the Pileated Woodpecker pounding the dead tree. My wife picked up her binoculars and watched in awe. I held my camera to my face and started to take photographs. Then, I realized, that the sun was in my eyes, the bird was in the shade and all the elements that create a great photograph were working against me. I took 3 photographs, dropped my camera and proceeded to raise my binoculars to my eyes. I would not miss this moment, even if it meant missing the opportunity to photograph the Pileated Woodpecker. My eyes would create a photograph that would remain with me for the rest of my life. If I was stubborn and tried to photograph the bird, I would have had no photographs and I would have missed my opportunity to see the bird up close. I made the right decision and I have no regrets. Sometimes, when you are faced with similar circumstances, drop your camera. You, too, will have made the right choice.